Our reuse program gives old electronics a new life. Buy reused & do some good! 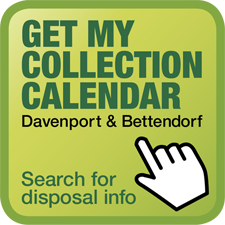 Davenport & Bettendorf residents: Find & print your collection calendar. Bagged recyclables end up at the landfill. Got Latex Paint? JUST CAN IT! Save your self a trip & Just Can It! Our hazardous material facility provides residents free disposal. Get specific directions for handling your bulky items properly. Newer light bulbs contain mercury and should not be thrown in the trash. Wood and other materials are accepted at the landfill. Do not flush old medications. Follow EPA guidelines instead.